Since the cheesecake brownies I baked two days ago is now in our stomach, I decided to bake another cheesecake. This time, I want to use Oreo cookies as the base since my little sis loves Oreos. So I modified the recipe using my favourite cheesecake squares recipe. 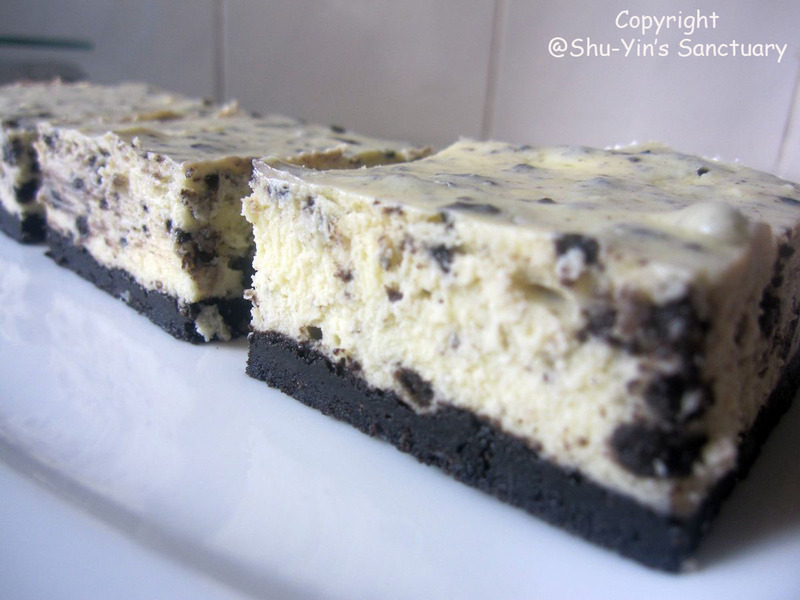 I also added in some crushed Oreo cookies in the cream cheese filling for that extra crunch. This is what came out from the oven after a night's chill in the fridge. The texture is so good. 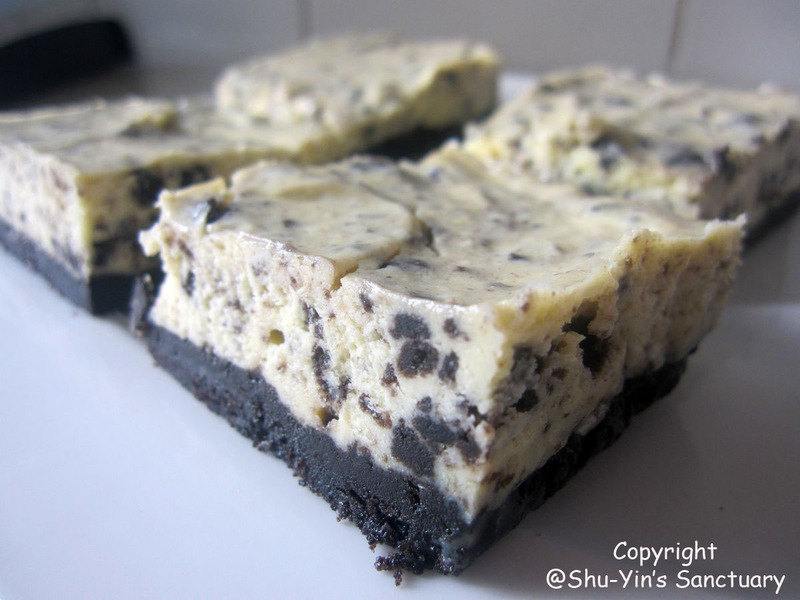 The added crunch of the crushed Oreos on the cream cheese filling is so satisfying. I'm starting to love homemade cheesecakes. Chill the squares for easier cutting. Also make sure you have a sharp knife and a damp cloth nearby so you can wipe off the knife between cuts. Cheesecake Squares: Preheat oven to 325 degrees F (160 degrees C) and place the rack in the center of the oven. Have ready a 9 x 13 x 2 inch (23 x 33 x 5 cm) square baking pan that has been lined with aluminum foil across the bottom and up two opposite sides of the pan. Graham Cracker Crust: In a small bowl combine the Oreo cookie crumbs, sugar, and melted butter. Press mixture evenly over the bottom of the prepared pan. Bake in preheated oven for 10 minutes. Set aside to cool. Increase the oven temperature to 350 degrees F (180 degrees C). Cheesecake Filling: In the bowl of your electric mixer, or with a hand mixer, beat the cream cheese until smooth. Add the sugar, lemon juice, and vanilla extract and beat until smooth. Add the eggs, one at a time, beating until incorporated. Scrape down the sides of the bowl, as needed. Fold in the 1/2 cup Oreo crumbs. Pour the cheesecake filling over the graham cracker base and bake for about 20 minutes or until the cheesecake batter is just set. Remove from oven and place on a wire rack to cool. Place in the refrigerator for a few hours to make the squares easier to cut. To cut into squares - place on a cutting board, remove the foil, and with a sharp knife, cut into 2 inch squares. Have a damp cloth on hand to wipe the knife between cuts. Makes about 24 - 2 inch (5 cm) squares. 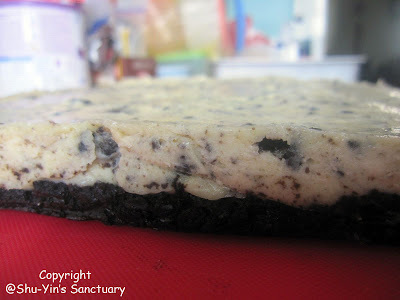 My nephew requested for Oreo Cheese Cake for his birthday in Dec'10. Came across your recipe, others need whipped cream and nonbaked. So I tried yours and the verdict from my nephew was, mmm..better than Secret Recipe & La Manila-haha! 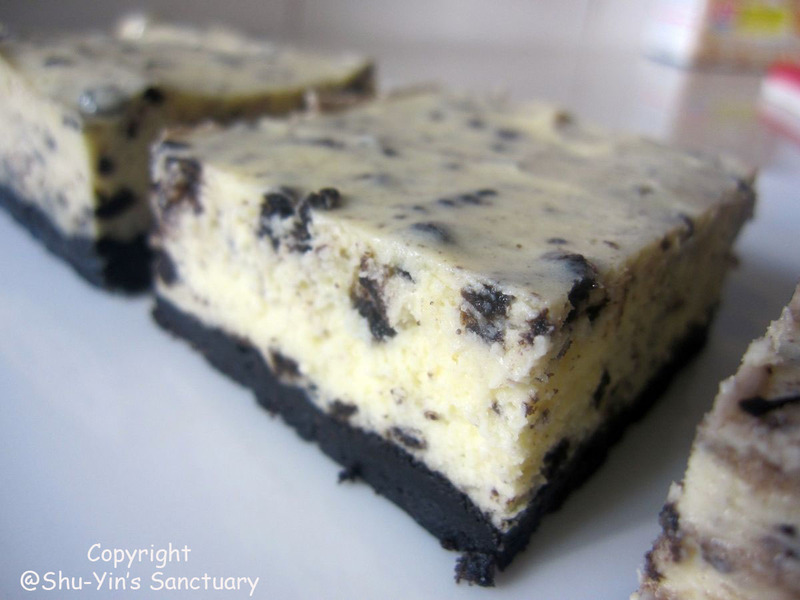 Tried baking your Cheese Brownie today-all I could say is AWESOME! Check out my comments under anonymous. Hie Jennifer, do u have a blog? saw many sweet indulgence matches when i tried googling it. btw, how did u stumble upon my blog? I came across your blog when i was searching for some chocolate cake recipes. Have u ever tried whipping up cream? I could not get it whipped despite chilling it. I am a novice baker. Just started in November. I actually have not tried whipping up cream. Or do u mean to say whipping up buttercream / frosting? I myself is also a novice baker. I started baking about a year ago and I learn everything from trial and error. i have not been to any baking courses and most of the things I learn thru the net/other people's blogs. Besides a chocolate lover, i love cream, icing cream, buttercream. Nowadays, there is a trend on fondant which i do not like. I only enjoy eating quality cakes with a good topping, something simple like choc ganache or cheese topping. I enjoyed your blog, do share more of the chocolaty stuff. i am really a chocolate fan. im a chocoholic. i love all kinds of chocs....except white choc. i find them too sweet. I baked the oreo cheese cake using your recipe but i did add whipping cream for about 3 tablespoon.. delicious and very soft!! !